Contact WTF Reform Is Revolution! The morning after last November's election, "Today Show" co-host Matt Lauer asked the question for all of America, "Is the State of Minnesota waking up asking, 'What have we done'?" He's been sworn in and it's still being called, "one of the more improbable upsets in U.S. political history!" 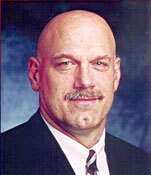 Former pro wrestler Jesse "The Body" Ventura was elected Governor of Minnesota. No wonder the Vikings had the best regular season record last year! There's something in the air up there! Running on the Reform Party platform, Ventura declared, "We shocked the world!" when speaking about his victory over Democrat Hubert Humphrey III and Republican Norm Coleman. "I think we proved the American dream still exists," Governor Jesse "The Mind" Ventura proclaimed. White House Press Secretary Joe Lockhart said, "Never thought that 'body slam' would become a literal phrase in politics." How else can you describe it? Actually, "Double Body Slam," is what a "Reform Party" candidate taking the Democrat AND Republican candidates out of the ring is really called. Coleman is mayor of St. Paul. Humphrey is the State's Attorney General. He brought a political legacy (son of the former vice-president) and his biggest career win (a lawsuit against the tobacco industry that brought in $6.1 billion for the state) to the race. But the power of the Vote spoke louder than the "perceived power." The race between Humphrey and Coleman was expected to be the "Gubernatorial Derby." But with 64 percent of precincts reporting, Longshot-Jesse "won" with 37 percent, accounting for 537,544 votes, Coleman "placed" with 494,252, or 34 percent and Humphrey "showed" with 405,711 votes; 28 percent. "I'll tell you what, I'll bet you they're never going to take the people lightly again, are they?" Ventura asked, continuing with the type of rough, straight talk that took his campaign from an idea, to a groundswell of support, to a powerful victory. You know what was in the air up there in Minnesota? A winning spirit! A spirit of change, risk, and unity! A spirit that connected with the power of the Vote and as "The Mind" said, "...shocked the world!" Just because it's "always been" only two parties at the table, doesn't mean there isn't room for a third, does it Jesse? When you bring "REAL POWER" power to the table, you're always welcome, right Jesse? Congratulations Governor Jesse "The Mind" Ventura!!!! You have become a HERO to "Underdogs" everywhere! Reform is Revolution! Call it "rough talk," but it's the "Double Body Slam" of the Vote that will ensure that owners and players will never take WeTheFans lightly again! Sports reform is "in the air." The FANS REVOLUTION is on the horizon. WeTheFans are about to "shock the world!" Catch the spirit! One of the most improbable upsets in U.S. political history demonstrates the"power of the vote." If a former wrestler can become governor of Minnesota, you GOTTA believe that Fans can change professional sports! "I'll tell you what, I'll bet you they're never going to take the people lightly again, are they?"